A feature-rich security system with wireless and voice control capability. Compatible with Alexa voice control. Stores up to 30 quotes. Built-in alarm and vibration sensor. Z-wave technology for locking and unlocking of door. Can’t add/ remove codes via phone. Weak batteries. 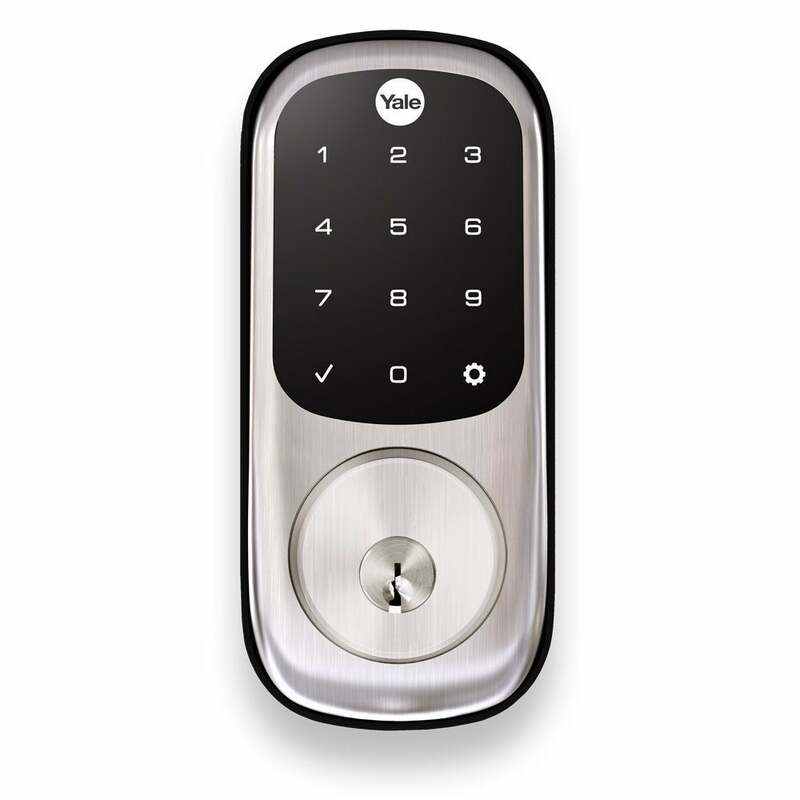 A customizable electronic lock available in multiple designs. Single-touch locking. Backlit keypad. Bump proof. Up to 8 user codes. Auto-lock feature. Louder than the average lock. Beautiful design. Away mode. Silent mode. Battery alarm. Double authentication with codes and RFID tags. Emergency power supply. Bump proof. A customizable device with wireless connectivity and enhanced weather protection. One-touch locking. Keyless entry. Voice assistance. Rubber seal for weather protection. Compatible with Alexa voice control. Volume control options. Up to 250 codes. 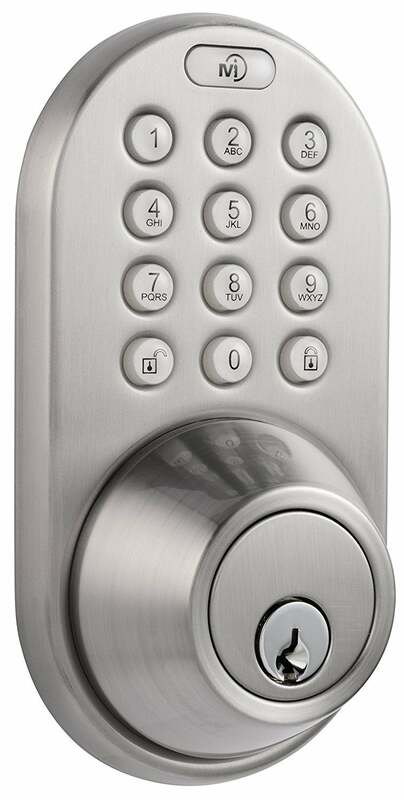 Affordable electronic keypad with multiple access codes. Keyless entry. Backlit keypad. Up to 6 user codes. 1-year electrical and 25-year mechanical warranty. No automatic lock or Bluetooth functionality. Interior cover is made of plastic. We all remember the time we forgot our keys at home and had to ask for assistance. If you don’t like paying to get into your own home or hiding your key under the carpet/ flower pot, then an electronic/ smart lock may be the right option for you. These locks have access codes along with the traditional key; they give you the peace of mind that you won’t be locked-out of your property. 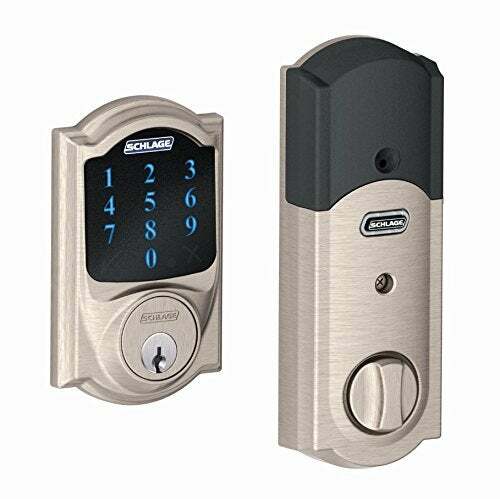 Besides two access options, the locks also have several other features to offer, including voice control, wireless connectivity, custom codes, and alarms. We have tested some top locks on the market and reviewed customer feedback for those products to create the following list. Electronic locks are different from a standard key and deadbolt lock because they use a magnetic field. These were first made for the hotel industry as a more safer solution compared to the standard locks due to their usage of programmable cards. Smart locks are the next step in door lock-innovation and different (old and new) manufacturers have their own take on it. Companies like Schlage and Yale, for instance, offer wireless mesh network technology called Z-Wave. You have multiple options with protocol for connecting the lock to your phone and other smart devices at home. The most common protocols are z-wave, Bluetooth, and wi-fi. Bluetooth: Benefit of having a Bluetooth device is that it will consume less battery compared to one with Wi-Fi. A disadvantage is that the range isn’t as wide. Unlike z-wave, The lock will connect directly to your phone, which is convenient. But, If you have many smart devices at your home, then it may be more convenient to have a hub. Z-Wave Technology: Z-Wave technology connects the lock to a compatible hub such as Wink hub, SmartThings, and Iris. The range of Z-wave connections can be increased by connecting more devices carrying the Z-wave signal. Wi-Fi: Wi-Fi is available with some models as a built-in feature. Others devices offer accessories to connect the Bluetooth device to the Wi-Fi network. If you’re looking to install the lock at a place that has multiple residents, then code customization is a good feature to have. Most locks allow several codes at a time, so you can assign a code to each person. Some devices will also detect which code was used to open the lock. While a smart lock does not necessarily make your home more secure than a regular lock, these locks do offer a variety of security features. These include alarms, autolock, double authentication, and prank monitoring, etc. 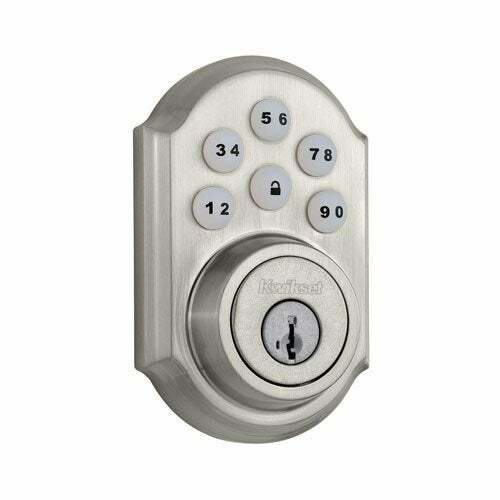 For instance, you can set this Kwikset to lock automatically after 30 seconds. 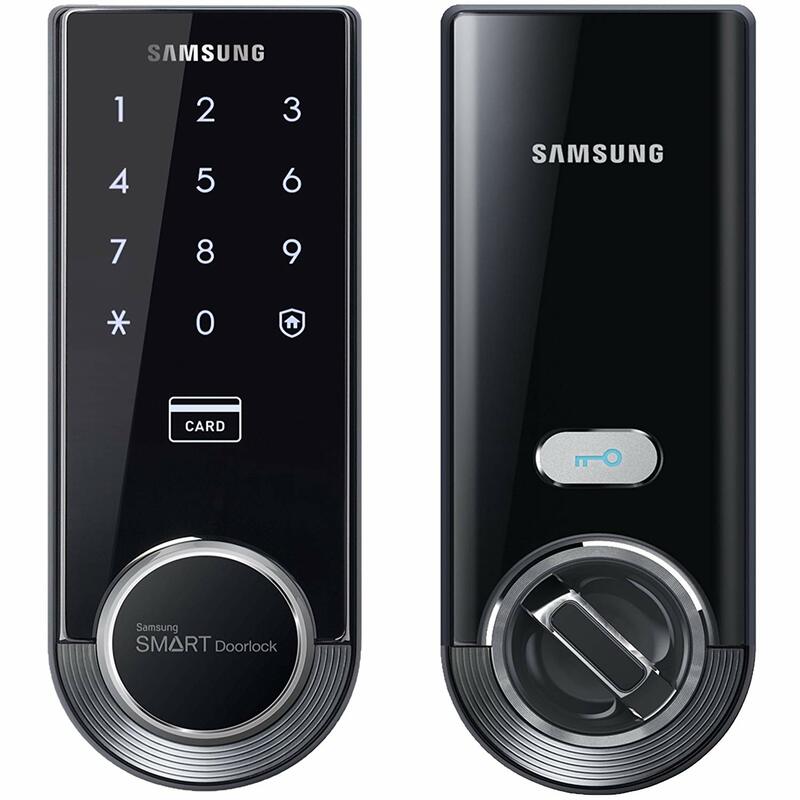 This Samsung lock requires double authentication: code and RFID tag. Another feature available with smart locks is prank morning: if somebody enters the wrong code several times, the door disables authentication for a few minutes. Depending on the device, you may have a touch screen or digital keypad. One thing to consider with the keypad is visibility in both dark and very bright conditions. Some keypads use backlights to help with the visibility. The lock may be installed in the most visible parts of the house, so they are designed for display. A common material is Satin Nickel. The Samsung SHS-3321 has a modern, black appearance. Other colors include bronze and brass. Besides selecting the right color, you should also make sure that the exterior and interior parts of the lock are of the same material. With some models, the cover that goes on the outside of the door may be of a different quality than the inside cover. You don’t want to end up with a cheap-looking lock. The price will depend on whether the device has advanced features such as wireless. For example, the wireless-enabled Yale costs around $160, while the Kwikset is around $90. Brand name will also be a factor. For instance, the $175 Samsung device does not have Bluetooth capability but has several other features, including NFC for certain devices, and, of course, the brand name. Noise produced by the lock is not a major factor, but it can be an important one if you have children or adults who could be disturbed by the sound. Some locks have the silent mode to minimize disturbance. While most smart locks come with a physical key, you don’t want to be in a situation where you forgot the key inside and the lock battery dies. The battery life will vary from product to product. For instance, a Bluetooth device will have a longer battery life (a year or more). Go through customer feedback to learn more about the battery life of the lock you like. Which type of lock is the best? It really depends on what type of lock you’re comfortable with and what features you value. Majority of devices have a standard lock to accompany the smart lock system. Another option is a keyless device. Once you know which type you like, research customer opinion about the other features that lock offers. How can I be sure about the material of the lock? It can be hard sometimes to determine the quality of a material from a picture. One suggestion is to look for high-definition videos of that product. Also, check the opinions of others who have used the product. Are electronic locks or smart locks better than regular locks? Smart locks face the same challenges that other IoT (Internet of Things) devices face. With electronic locks, there is no internet connectivity, but that doesn’t mean that they are better than the standard products. It comes down to convenience and the company/ product. What are the pros and cons of the different locking methods? Each locking method has its benefits and drawbacks. The drawback of metal keys and key cards is that they can be damaged or misplaced. With codes, the 4-digits can be confused, forgotten or stolen. A benefit of codes is that they can be changed relatively easily. In the case of physical keys, the changing process will require the services of an expert. A drawback of electronic-only systems is that they cannot be used in the event of a power failure.